In 2015, the top 10 Core HR software vendors accounted for 54% of the HCM applications market segment which grew 6% to approach $8.3 billion in license, maintenance and subscription revenues. 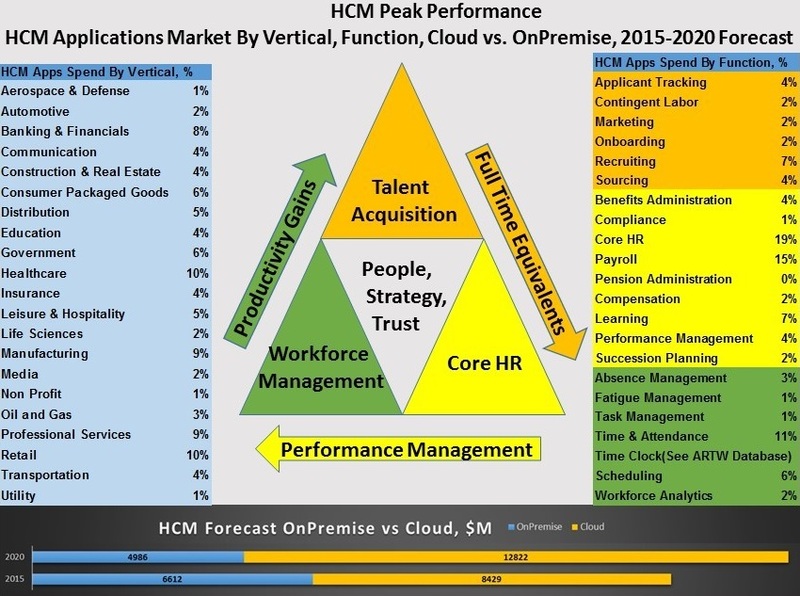 As a whole, Core HR applications represented 55% of the overall HCM applications market. Last year SAP was No. 1 in Core HR with 14% market share and $1.1 billion in HCM Core HR product revenues, following a 10% rise in license, maintenance and subscription revenues. Workday was No. 2 with 9% share, ADP was the third at 8% and Oracle and SumTotal Systems, a Skillsoft Company were fourth and fifth with 6% and 4%, respectively. Through our forecast period, the Core HR applications market, which is comprised of nine subsegments, is expected to reach $9.2 billion by 2020, compared with $8.2 billion in 2015 expanding at a compound annual growth rate of 2%. For Top 10 vendors in each of the nine subsegments, please check their own index page by following their link below. Here are the rankings of the top 10 Core HR software vendors, their market shares in 2015 and recent developments. 1 SAP 1020 1118 10% 14% Number of SAP SuccessFactors Employee Central customers for Cloud Core HR applications exceeded 1,350 in 3Q16, while total HCM suite customers now number 6,000 and 45 million users. 2 Workday 480 714 49% 9% Recent launches included Workday Learning, Workday Planning and Workday Student, while number of Workday customers could top 2,000 by early 2017. 3 ADP 620 662 7% 8% Continues to gain ground in midmarket with Cloud-based Workforce Now, offering 75,000 customers a mix of WFM, Core HR and Payroll products. 4 Oracle 560 533 -5% 6% In its latest quarter, Oracle said its Cloud HCM applications sales spiked 131% after signing 436 deals including more than half from new customers. 5 SumTotal Systems, a Skillsoft Company 249 299 20% 4% SumTotal spruced up its user experience by focusing on personalization across the unified Talent Suite, along with its leadership position in Learning. 6 IBM 310 274 -12% 3% Aligning its HR strategy with its advanced analytics, machine learning domain expertise. 7 Ultimate Software 201 248 23% 3% Saw 67% attach rate for its performance management applications when selling Core HR and Payroll in third quarter of 2016. In September 2016, Ultimate acquired Kanjoya for workforce analytics. 8 Paycom 147 219 49% 3% Competitive Core HR, payroll and other HCM software offerings for midmarket customers. 9 DATEV 194 200 3% 2% In 2016, Robert Mayr took over as the new chairman, replacing Dieter Kempf who had led the BPO for 20 years. 10 Paychex 160 175 9% 2% Big push on Paychex Flex that encompasses payroll, Core HR, time and attendance as its online services now accounting for 10% of its HR services revenues. Check the Top 10 HR software vendors in 22 HCM market segment as part of our HCM Top 500 market research. These top 10 vendors are ranked by their latest annual product revenues attributable to that particular market segment. It also summarizes the market outlook and our forecast assumptions at the group level and for that segment, respectively. Performance & Goal Management HR performance management applications are designed to automate the aggregation and delivery of information pertinent to the linking of job roles and the mission and goals of the organization. More specifically, the system allows users to automate the performance review process by using mechanisms such as training and key performance indicators to continuously track and monitor the progress of an individual employee, work team, and division. Some of the key features include: Assessment of individual career objectives and organizational skills gaps that impede performance and job advancement. Continuous reviews and establishing milestones. 360-degree evaluation and real-time feedback. Performance appraisal automation. Goal setting and tracking. Employee surveys. Alignment of human assets to corporate objectives. Fast tracks for top performers. Learning & Development Learning management systems refer to applications that automate the administration, tracking, and reporting of training events. Other tools may include courseware and other delivery, management, tracking, or integrated solutions whose focus is on the learning environment, including learning content management systems. Career development tools include apps for coaching, mentoring, employee development planning, and diagnosing of development needs. Succession & Leadership Planning Identify and address current and potential talent gaps to create succession management reporting. Develop and maintain a continuous supply of internal talent to fill critical job roles. Improve employee engagement through digital tools to advance career path development opportunities.